Healthy zucchini brownies are sweet and fudgy but made healthier with zucchini, ground flax, whole wheat flour and much less sugar than your average brownie recipe. I would never rush the end of summer but there is something about late August that puts your mind into September, and revs the back-to-school engine when it is still beach weather. Looking ahead to the start of school I’m already thinking about snacks to bake for my kids to take in their lunches or to nibble after school. I’m in search of recipes that are on the healthy side. Zucchini is piled high at the markets these days. I have been stocking up and adding it to all sorts of things, including baked goods. Zucchini is great for baking because it is tender and doesn’t have a lot of flavour on its own. 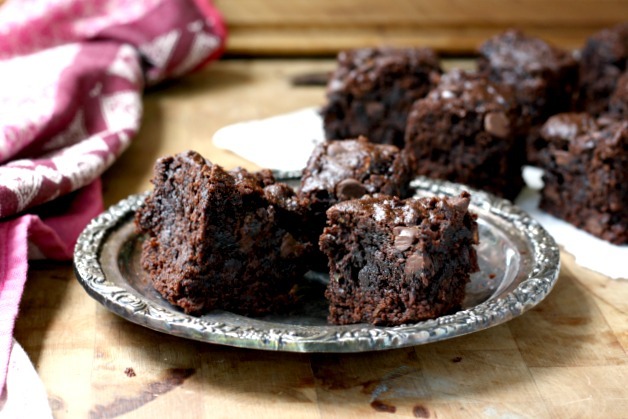 I love zucchini bread and muffins but these zucchini brownies are a new favourite. They’re sweet and fudgy but made healthier with zucchini, ground flax, whole wheat flour and much less sugar than your average brownie recipe. Line a 9”x 9” pan with parchment paper or grease it well. In a large bowl whisk flours, flax, cocoa powder, baking soda and salt. In another bowl whisk together oil, sugar, vanilla and molasses. Beat in the egg. Add this mixture to the dry ingredients and mix well.